In earlier times, no fireplace was considered complete without a fireback. Leaned against the wall of the fireplace, the fireback expresses the owners' tastes and helps protect the back wall of the fireplace while enhancing the heat output. 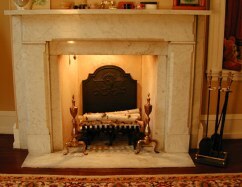 Check sizes shown to be certain the style you like will fit against the back wall of your fireplace. These are popular collectible items for a country decor and also look great in other areas of your home. May be used when burning either wood or gas logs in your fireplace. Click any item for complete details.